While bayesloop provides a number of observation models like Poisson or AR1, many applications call for different distributions, possibly with some parameters set to fixed values (e.g. with a mean value set to zero). The sympy.stats and the scipy.stats modules include a large number of continuous as well as discrete probability distributions. The observation model classes SciPy and SymPy allow to create observation models to be used in bayesloop studies on-the-fly, just by passing the desired scipy.stats distribution (and setting values for fixed parameters, if necessary), or by providing a sympy.stats random variable, respectively. Note that these classes can only be used to model statistically independent observations. In cases where neither scipy.stats nor sympy.stats provide the needed model, one can further define a custom observation model by stating a likelihood function in terms of arbitrary NumPy functions, using the NumPy class. + Successfully determined Jeffreys prior: 1/sqrt(lambda). Will use corresponding lambda function. First, we specify the only parameter of the Poisson distribution (denoted \(\lambda\)) symbolically as a positive real number. Note that providing the keyword argument positive=True is important for SymPy to define the Poisson distribution correctly (not setting the keyword argument correctly results in a error). Having defined the parameter, a random variable based on the Poisson distribution is defined. This random variable is then passed to the SymPy class of the bayesloop observation models. Just as for the built-in observation models of bayesloop, one has to specify the parameter names and values (in this case, lambda is the only parameter). + Set prior (function): <lambda>. Values have been re-normalized. 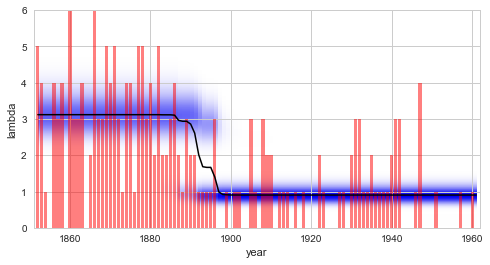 We continue by describing the use of probability distributions of the scipy.stats module. Before we show some usage examples, it is important to note here that scipy.stats does not use the canonical parameter names for probability distributions. Instead, all continuous distributions have two parameters denoted loc (for shifting the distribution) and scale (for scaling the distribution). Discrete distributions only support loc. While some distributions may have additional parameters, loc and scale often take the role of known parameters, like mean and standard deviation in case of the normal distribution. In scipy.stats, you do not have to set loc or scale, as they have default values loc=0 and scale=1. In bayesloop, however, you will have to provide values for these parameters, if you want either of them to be fixed and not treated as a variable. Comparing this result with the regime-switching example, we find that the model evidence value obtained using the scipy.stats implementation of the Poisson distribution is different from the value obtained using the built-in implementation or the sympy.stats version. The deviation is explained by a different prior distribution for the parameter \(\lambda\). While both the built-in version and the sympy.stats version use the Jeffreys prior of the Poisson model, the scipy.stats implementation uses a flat prior instead. Since the scipy.stats module does not provide symbolic representations of probability distributions, bayesloop cannot determine the correct Jeffreys prior in this case. Custom priors are still possible, using the keyword argument prior. In some cases, the data at hand cannot be described by a common statistical distribution contained in either scipy.stats or sympy.stats. In the following example, we assume normally distributed data points with known standard deviation \(\sigma\), but unknown mean \(\mu\). Additionally, we suspect that the data points may be serially correlated and that the correlation coefficient \(\rho\) possibly changes over time. For this multivariate problem with the known standard deviation as “extra” data points, we need more flexibility than either the SymPy or the SciPy class of bayesloop can offer. Instead, we may define the likelihood function of the observation model directly, with the help of NumPy functions. C:\Anaconda3\lib\site-packages\ipykernel_launcher.py:13: RuntimeWarning: covariance is not positive-semidefinite. 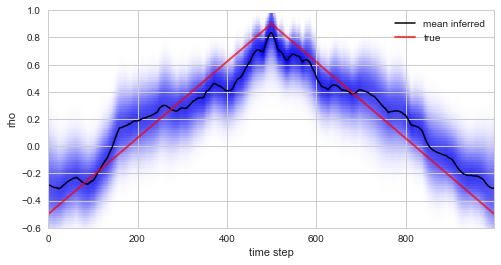 Note that in this case, the standard deviation \(\sigma = 1\) for all time steps. 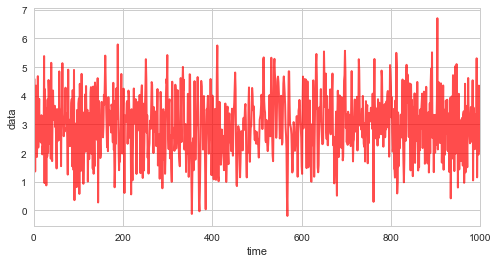 Plotting the true values of \(\rho\) used in the simulation of the data together with the inferred distribution (and posterior mean values) below, we see that the custom model accurately infers the time-varying serial correlation in the data. If the left side of this conditional probability contains data points from more than one time step, the algorithm will look at each data point more than once, and this generally results in an underestimation of the uncertainty teid to the model parameters!